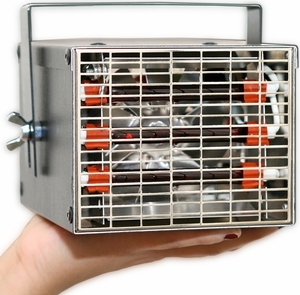 These heaters are hand built in the USA with only the very best parts, motors, and wire. The heaters are not constructed of snap together plastic, and cheap internal parts. These heaters are designed to last you a lifetime, not a season. These heaters will work in any vehicle with a DC electrical system and available models from 12 to 48 volts including cars, trucks, vans, buses, heavy equipment, etc. These heaters have a newly designed fan and motor assembly as well as a complete new mounting system. These heaters are the perfect choice for the person who wants to add reliable INSTANT heat in just a few minutes. No water lines to run, fittings to install or worry about a corroded core down the road, and most importantly INSTANT HEAT, INSTANT DEFROST. No warm up time! These heaters are available from 12-48 volts and different wattage as well. These heaters are simple to install and can be operational in minutes. Measuring only 6" long and 5" tall, our Stealth heater will fit in virtually any small space. RuCar heating elements allow the heaters to be mounted vertically OR horizontally which allows even a tighter mounting space. The RuCar heating elements have been tested to have a life expectancy of 10,000 hours, are vacuum sealed, and are exclusive to these heaters. RuCar heating elements are up to 50% more efficient than standard alloy heater elements. This heater features a High and Low heat settings. Comes complete with mounting bracket, hardware, crimp on electrical ends, fuse, and fuse holder. Optional Remote Switch relocates the on/off switch 3 or 4 feet away from the heater.